La Caretta is finally open. It seems like it’s been years of slowly watching the transformation from Bickford’s to what it is now. Inside got a lot of remodeling but still somehow still feels Bickfordy. The host was nice and our server was friendly and promptly brought over fresh chips and salsa. 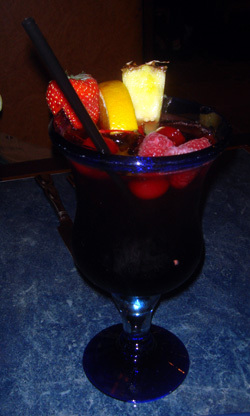 I really wanted some sangria so I ordered one and a pretty glass with fruit and berries arrived and the drink it self was really good. I had a hard time deciding what to get off the menu but I chose a grilled vegetable quesadilla- not exciting I know but it was everything I was in the mood for- flour tortilla, vegetables, guacamole and cheese. What I really liked about this was that the tortilla was perfectly grilled, it was crispy from the grill but still very soft. Inside the cheese was perfectly gooey inside and filled with big chunks of vegetables. My friend Jim got something form the combination section of the menu- #4. Tacos with an enchilada and something else (I think). Their website doesn’t have anything on it so I can’t refer to an online menu but Jim says the #4 combo is great. Prices are decent. Honestly, I forgot how much the meal was but I remember it being reasonable. La Caretta is at 270 Cochituate Road. Like I said, no website, but if you have any questions about anything like hours or prices or anything like that, their phone number is listed as (508) 424-2535. Also, I’d like to add that they had something like 5 kinds of hot chocolate listed on the menu so I would go back to try a Mexican hot chocolate or one of the other varieties they have. I’m glad you made it La Carreta! I thought it was excellent. We went there on their 2nd night open, and the service was excellent as well as the food. The salsa and chips arrived at the booth as soon as we did. They did an elegant remodel of the place. The wall treatments were gorgeous with hand-painted and sponged texture and detail. The booths were roomy and comfortable. The silverware was heavy quality, not chintzy stuff that gets remodelled in the dishwashers! This is their first store in Massachusetts — they have 3 in New Hampshire. Quite a few really authentic dishes on their extensive menu. I ordered the Enchiladas Mole and Neal ordered an combo enchilada dish. I got three lovely enchiladas filled with delicious chicken, with the mole (chocolate) sauce. I’m not a big rice and refried beans fan, so I asked for black beans instead. They were amazingly good! And real Mexican-style hot chocolate (made with water, cinnamon, and chiles – not a creamy hot chocolate like Americans are used to, but authentically delicious Mexican hot chocolate). It took them forever to literally rebuild Bickfords brick by brick. It’s unfortunate they finhished just after Margueritaville opened just down the street!! The reviews sound very good. I hope they make it!! ah we almost tried it when we going to margaritas. I sooooooo wish I had instead. margaritas was horrid! i think it was only 2nd weekend open but food sucked & service was even worse. our waiter didn’t remember taking our order. no, im not kidding. he asked if someone took our order & I looked @ him & said You did!! You took our order!!! UGH! I went there the day before thanksgiving and the appetizers were outstanding !! Not the crap you get at chain mexican places. A website http://www.lacarretamex.com/ . I’ve been to one of the NH locations and loved it. I miss the old Chi-Chi’s, so I’m looking forward to checking this place out. Sounds good. I want to go out to eat with you! Perry, by Margueritaville do you really mean Viva Mexico in wayland? if not where is Margueritaville located? The only new ‘mex’ besides La Caretta I know of is Moe’s Southwestern going in where pizza hut used to be on rt 9.
btw, I’ve been to La Caretta twice now (dinner and lunch). Both excellent. I love Chorizo and they have a couple of dishes with it best is pollo chiro which is a chicken breast with cheese sauce and Chorizo on top. One more thing. When I was there on Tuesday night the Guy’s from Phantom Gourmet were there eating. I didn’t want to disturb them but they seem ‘smaller’ in person. I guess they really do go out as a group. loves tacos, I believe Margaritaville is actually Margaritas (? ), located in the old Naked Fish building at Speen and rt. 30. Yes…it is Magarita’s nmjot Margaritaville at the corner of Rte 30 and Speen St.Sorry to confuse you! We drove by there Friday nite and the parking lot was jam packed!! I can’t wait to go here after reading the reviews here! We love Acapulcos on Rt 9, and have been to Margaritas in Waltham, but this is so close to us! It will be interesting to see how La Caretta and Margaritas do, being so close to one another! Went there for lunch 2nd week open. Delicious. Still a few new restaurant wrinkles but very good. It’s not inexpensive. Lunch value is certainly better. Drinks are pricey. Margarita’s start at 8 or 9 bucks. I wonder why Pizza Hut closed….I can’t wait for Moe’s!! Since you like the Old Framingham History stories and such…..
Did you know that building was constructed as and its original use was a car wash? I think it was called Coach and Carriage or something like that. Call this place Mexican if you want, but authentic La Carreta is NOT. Cheese quesadillas, not Mexican. Nachos, not Mexican. Hard corn taco shells, NOT MEXICAN! This is about as American as a Mexican restaurant can get. I can’t imagine it will last long. With Margaritas now open and much more polished in the art of American Mexican food, this place can’t last. Gee scott have you even eaten there yet? or do you work for margaritas?? We were there last sat night and it was great. we will be back. much better than Accapocos. I had the pork tacos. three soft flour tortillas filled with seasoned cubed pork with cilantro and onions to put on. the side of black beans and rice was great. I typically dont eat rice but this was good enough for me. We had 10 people in our party and everyone liked what they got. Scott must work for Margaritaville. Nothing authentic with Chain restaurant, prepackaged microwave mexican. Oh and the wait staff is all american too ! Went to La Carreta last week. The food was very good, but they’re still working the kinks out. They kitchen staff that delivers the food walks around asking if someone ordered whatever they’re carrying (which I hate). They delivered the wrong food to our table, which took a few minutes to correct – after we tried what they brought. It’s somewhat loud and the tables are too close together. We’ll go back, but ask for a booth next time. We planned to meet friends a couple of weeks ago at “the new Mexican restaurant on Rte. 30” and we went to Margarita’s and they went to La Carreta. I hadn’t known La Carreta finally opened and they didn’t know about Margarita’s. Thank goodness for cell phones. Margarita’s was packed, very noisy and had a long wait, so we ended up at La Carreta. I agree it feels “Bickford-y” despite the endless renovations, but maybe that’s because I remember it as Bickford’s. Anyway, everyone liked what they ordered and we’ll likely be back. I do wish they gave more tortillas with the fajitas, though. I grew up with a Margaritas in Mystic, CT and love it so I was pretty excited for the Margaritas in Framingham to open just 2.5 miles down the road from where we live. Of course I was perplexed as to why they would open one where they did when La Caretta was already in the process of opening down the road (and Viva Mexico was on the same road in the opposite direction). Even though I really like Margaritas, LA CARETTA IS 1,000 TIMES MORE DELICIOUS!!! The margaritas were excellent and with so many tequila choices. I had the enchiladas mole poblano and they were very tasty! Even the refried beans and rice were awesome. In fact, next time I’m ordering extra rice because it was so good. My boyfriend ordered the enchiladas Mexicana and they were equally as delicious as mine. 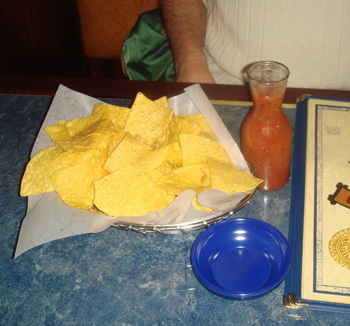 We can’t wait to go back to La Caretta and try more dishes. This restaurant DEFINITELY beats out Margaritas, Acapulcos and Viva Mexico – which was actually not good at all actually. No, I do not work for Margaritas nor am I a fan of Margaritas either. I was simply responding to the fact that someone called the food authentic Mexican food, which it most definitely is not. Have you ever been to Mexico? Have you eaten locally anywhere in Mexico? I went to Margarita’s and I waited an hour before we got seated. I wouldn’t mind the wait if it was good food, but the food was so bad, i am used to Acapulcos and it’s my favorite. I can’t wait to try the food at La Carreta, I have heard a lot of good reviews about this place. In Margaritas the only thing good was the drinks other than that I would never go there again! sorry to have to be a dissenter here. Went to LC on Friday the 28th, and didn’t have a great experience. Actually, the Staff was fine, but the problem was just the service. The waitress came and took our order just fine, but it took forever to actually get our food! After about 45 minutes, we started questioning where it was, as the waitress never came over to say anything, and we noticed that several tables around us that had come in after us were actually finishing their meals, but we hadn’t been served yet. By this time my son was starting to get fussy, so we just had to get our food to go. Thankfully, they only charged us half price, and the food was, in fact, pretty good, but apparently there are still some kinks to work out there. I’ve been to each restaurant twice now. They are very different. 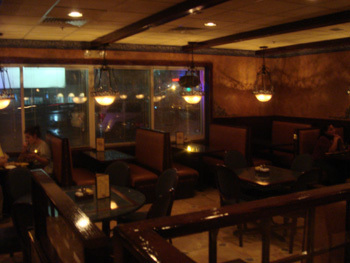 La Caretta is a Mexican Restaurant. There are Mexican hosts, waiters and cooks. 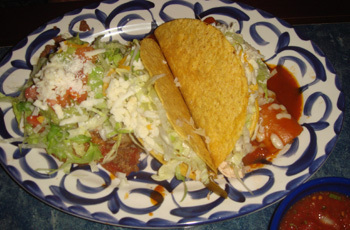 Margaritas is an American Restaurant with a Mexican theme. The staff is American. I enjoyed each restaurant. It’s nice to have the choices. 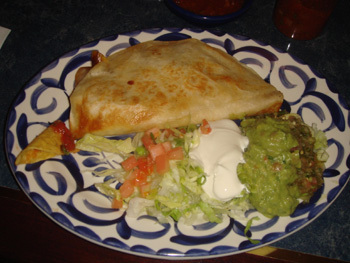 We haven’t tried Margaritas yet but did give La Caretta a try based on this blog. We were happy with our choice. I don’t know if I’d call it “authentic Mexican” by any stretch, but if you’re in the mood for some Mexican-ish food that isn’t fast food and actually made of real meat, then you could do worse than La Caretta. We found the Staff to be just fine, not annoying us every few minutes but always there if we needed a refill or what have you. Their appetizer platter is HUGE and I wish we had known that before we ordered, but we were happy with both the appetizers and our Meals. It’s just that with the appetizer included we had enough food for 3+ meals! Definitely a good size if you’re out with friends, but big portions if it’s just two people dining. I also enjoyed their Sangria. Next time I’m in the mood for some Chimichangas we’ll be back at La Caretta.